Born: 2 January 1857, Peshawar, Pakistan. Stephen F. Townsend, son of Surgeon-General S.C. Townsend, was born in what was then north-western India, now Pakistan. He was educated at Marlborough College, Wiltshire, England, and came to South Africa in June 1878. On 21 September 1885 he married Helen C. Honey, with whom he had six children. He joined the Cape Government Railways as an assistant engineer involved in construction and witnessed the extension of the railway from Matjesfontein in the Cape Colony (1878) to Broken Hill (now Kabwe) in Zambia (1907). 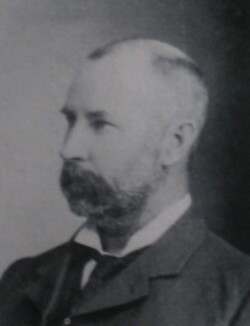 When the railway was extended northwards from Kimberley, Townsend was a district engineer and was in charge of the construction of the bridge across the Vaal River at Fourteen Streams (1890). Subsequently he was the resident engineer in charge of the extension of the line north of Vryburg. During the eighteen-nineties he was chief of the engineering staff of the Rhodesia Railways in South Africa, working under the consulting engineers Douglas Fox and Charles H.T. Metcalfe*. At some time before 1903 he moved to Rhodesia (now Zimbabwe) where he became chief resident engineer and agent for the Rhodesia Railways at Bulawayo, a post he held until his retirement in 1917. He then settled in Plumstead, Cape Town, where he remained for the rest of his life. In 1899 Townsend became a foundation member of the Rhodesia Scientific Association in Bulawayo and remained a member to at least 1918. In February 1904 he read his "Notes on a new gladiolus ('Maid of the mist') from the Victoria Falls" before the association. The paper was published in the Proceedings (Vol. 4, pp. 70-72) for that year. He was a foundation member also of the South African Association for the Advancement of Science (founded in 1902) and served on its council in 1910. In 1909 he became a member of the South African Ornithologists' Union. National Automated Archival Information Retrieval System (NAAIRS). . Documents relating to Townsend, Stephen Frank / Townsend, S.F. Rhodesia Scientific Association. Proceedings, 1904, Vol. 4, paper by Townsend; 1906, Vol. 6(1) and 1918, Vol. 16(2), lists of members. South African Ornithologists' Union. Journal, 1909, Vol. 5(3), roll of members.